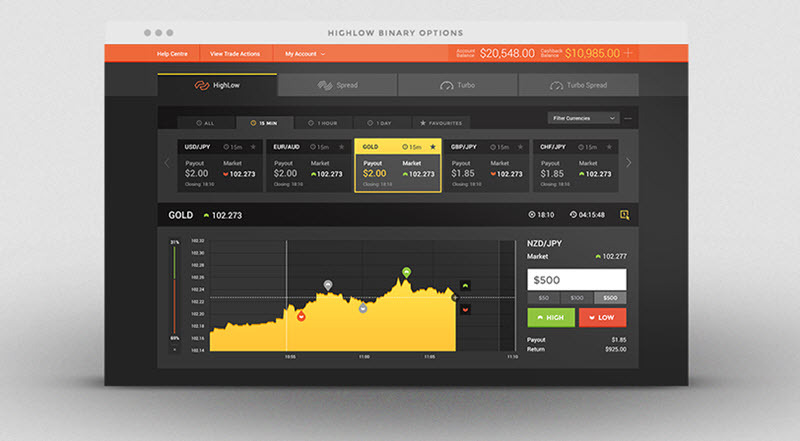 HighLow is an Australian-based online site where you can trade in binary options based on commodities, currency pairs, stocks and other assets. The largest selection of underlying assets is found in the forex section, but HighLow have a lot to offer commodity binary option traders as well. You can use the demo account without having to sign up first. This isn’t just great news for newcomers – many regulars at HighLow use the demo account to test out new trading strategies and learn about new features. Trades as small as 1 GBP are possible here, so you don’t need a huge bankroll to get started. Also, wish such small trades, you can achieve a nice risk spreading even with a small bankroll. Over 40 different deposit methods accepted. No withdrawal fee and no daily limit on withdrawals. HighLow is regulated by the Australian Securities and Investment Commission (ASIC). The trading platform is easy to use, with selection tabs located at the top of the trading area. On the left, you’ll see a drop down menu in which you can find underlying assets for binary options, including commodities. Once an underlying asset has been selected, the main price chart area will update automatically. Use the trading buttons to the right to adjust factors such as trade size, direction, etc. For quick future access, select your most traded assets in the favourite area (below the asset choices). High/LowWill the asset price be higher than the current strike price when the binary option expires? High/Low SpreadSimilar to High/Low, but riskier and with the possibility of very high payouts (sometimes 200%). Minimum deposit is 50 USD. HighLow is great when it comes to withdrawing money, because they charge no fee for withdrawals and there is no daily limit on withdrawals. If you want your withdraw processed as quick as possible, ideally use credit cards or Neteller. HighLow is a broker based in Sydney, Australia and regulated by the Australian Securities and Investment Commission (ASIC). Among other things, ASIC requires that HighLow keep all client funds segregated from other funds. All client funds are therefore kept in a separate trust fund and not in standard company accounts. This makes it much safer for the clients in case of corporate bankruptcy or similar. The trust fund is operated by the National Australian Bank (NAB).